Kanapki are multi-layer bites of goodness that are the perfect finger food for a cocktail party or starter for a larger dinner party. Most are assembled from little rounds of rye bread or pumpernickel, artfully layered with components such as cheese spreads, green and black olive, herring, small slices of kielbasa, sardine, small cheese slices, and much more. Back in the day, Peter’s parents loved to entertain at home. And Peter’s Dad was a master Canapé artist. The morning of a fancy house party, he would line up all his ingredients on the kitchen counter and form an assembly line. Then he would start the creative process. His tools were a small cutting board, sharp paring knife, cocktail fork and tweezers. Heading up the line were three types of bread: cocktail rye, pumpernickel rounds, and slices of French baguette cut into thin, two or three-inch slices. 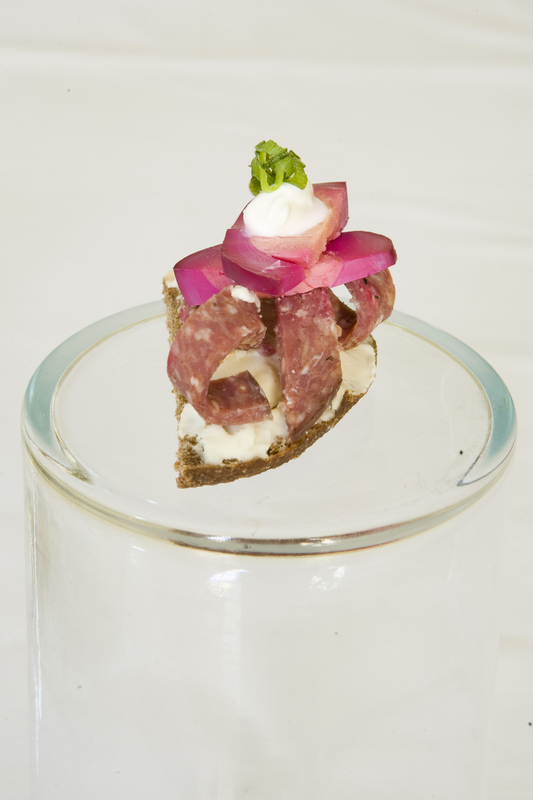 The first layer was usually a soft spread such as butter, brie cheese, pâté, or one of the spreads below. 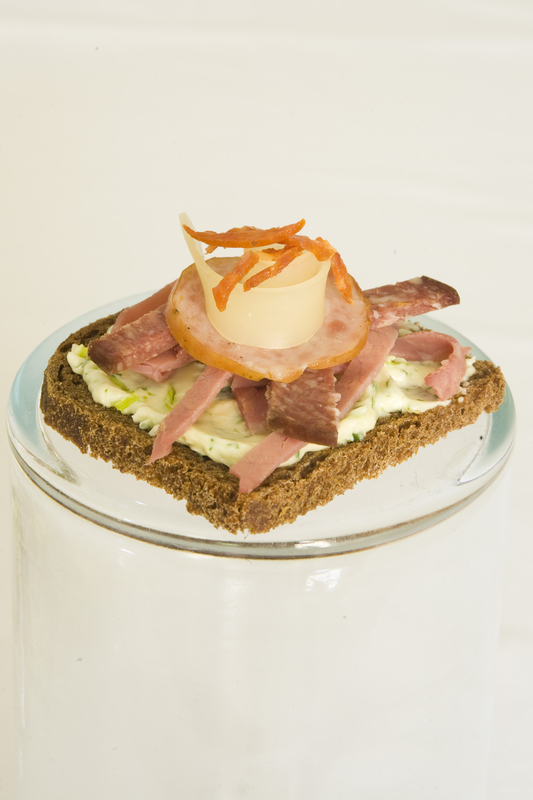 The second layer could be a protein: slice of kielbasa, smoked salmon, piece of sardine or pickled herring. The third layer could be a slice of pickle, tomato or sometimes a slice of hard boiled egg. 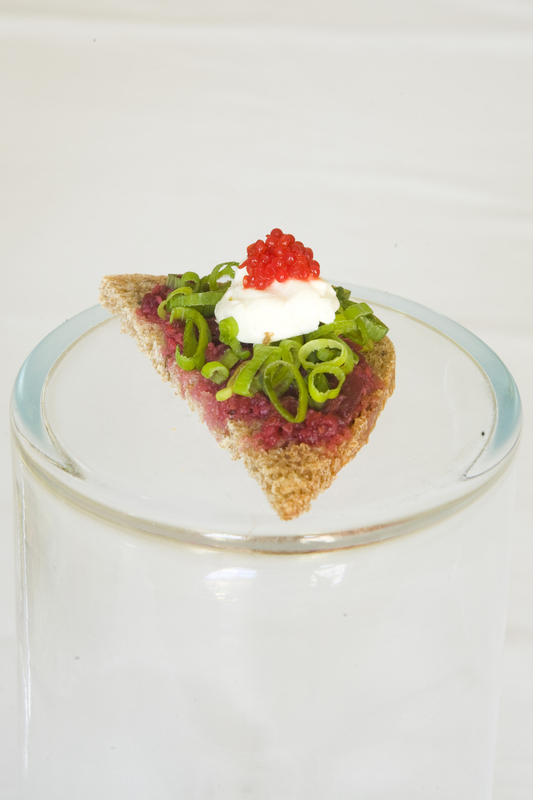 Finally that gorgeous “tower of flavor” was topped off with a tiny dollop of sour cream or mayo, and then a bit of caviar or a sprig of dill. 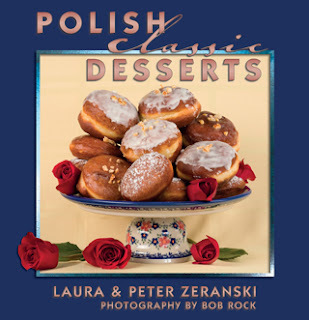 Peter’s Dad didn’t follow any rules or recipes, but his creations were all about great ingredients, creating an amazing balanced bite, and of course - the visual presentation. It’s an art form. 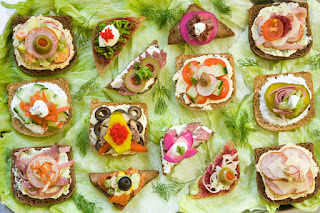 Here are several spreads that work well as the first layer on your cocktail bread. Let your creativity run wild and go for it! Blend the butter and mustard until creamy. Variations: instead of the mustard, try with: 2 tablespoons finely chopped green onions; or two tablespoons of fresh chopped dill; or 1 tablespoon of prepared horseradish (more or less to taste).